East Liverpool River-Rail Terminal Co. in Columbiana County, Ohio, across from Chester, West Virginia. 1. Spill was caught by a company employee within moments of the spill. Travis Orr is the terminal manager at East Liverpool River-Rail Terminal Co. He said he heard a crash early Friday morning around 8:15 a.m., moments after a tanker truck began loading the chemical styrene out of a tank at the facility. Upon exploring the scene, he discovered that valves weren’t properly in place and styrene, which Orr describes as a chemical that looks like liquid styrofoam, was spilling across the floor into facility storm drains. His employee was able to shut the operation down. 2. An estimated 50 or 60 gallons of styrene spilled. The tank holds as much as 400,000 gallons of product, but Orr said it was almost empty Friday, Jan. 15, registering only about 22,675 gallons. He said it’s almost impossible to know exactly how much of the chemical was released but he and other responding officials guess it couldn’t have been more than 50 or 60 gallons - most of which never made it to the river. East Liverpool Fire Department Chief Bill Jones explained that an earthen dike behind the facility was designed as secondary containment to hold any rainwater or spills until it could be tested and cleaned or released into the river. But a faulty valve allowed the the product to leak through into the Ohio. The leak was downstream of both East Liverpool’s and Chester’s public water intakes. Water companies were notified and took precautionary measures, nevertheless. Orr followed procedures after he found the leak. He called the National Response Center, the Coast Guard, and then Ohio’s Environmental Protection Agency. Area offices of emergency management were notified, which, in turn, notified local authorities. East Liverpool Fire Chief Jones said the company put absorbent booms in the river but that they were inadequate. The fire department then used containment booms to keep the chemical from dispersing downstream. Orr hired Weavertown Environmental Group to cleanup the mess. Vacuum trucks cleaned the sheen off the water, the storm drain, and cleaned the bank of the river. Orr said no citations were issued on site and he hasn’t received any so far. He said both his employee and the truck driver were negligent and responsible for the spill. The employee of the East Liverpool River-Rail Terminal Co. lost his job as a result. Fire Chief Jones said while he had reservations about the company's emergency plan - he was pleased at how well organizations worked together across state borders to contain and clean up the spill. Jones said he spoke with Orr at the company to modify emergency plans so that local authorities would be second on the call-list, and verified that a checklist for the procedure of loading chemicals into tankers would be reinstated at the facility. According to the Environmental Protection Agency, styrene is used to produce plastics and resins. Ohio is the sixth-largest chemical producing state in the country, and West Virginia the 24th, with a combined $8 billion in products sold to customers around the world, according to the American Chemistry Council. Emergency officials have confirmed a chemical leak into the Ohio River in the area of Chester, West Virginia and East Liverpool, Ohio. City of Liverpool Assistant Fire Chief David Edgell said a regional HAZMAT team made up of his department and fire departments in West Virginia are responding to a "small release" of what they believe is Styrene into the river. He said the leak was discovered at some point after 10 a.m. Friday and has since been contained. The chemical plume created by a spill in Charleston, West Virginia, is traveling down the Ohio River by Cincinnati today. The spill was discovered Friday; 7,500 gallons of a chemical used to clean coal called methylcyclohexane methanol—or MCHM—leaked into the Elk River, and contaminated the region’s drinking water for days. 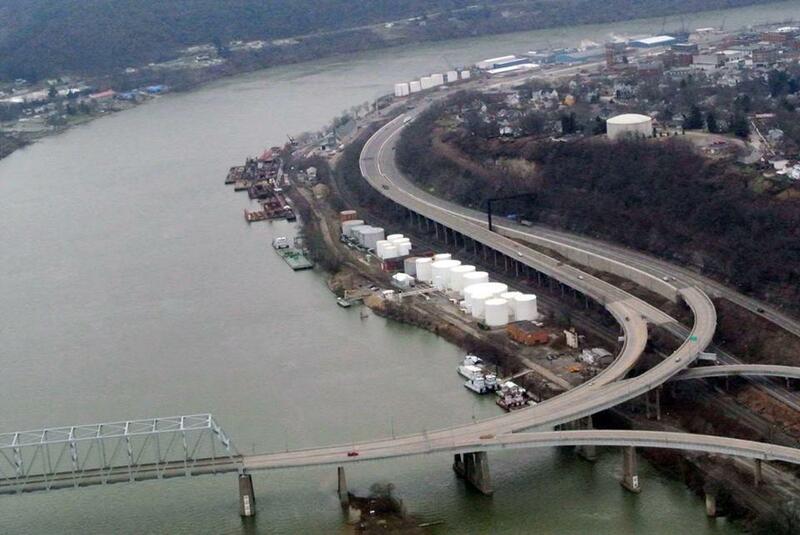 Now, communities along the Ohio River are dealing with the spill’s aftermath in different ways. The Cincinnati and Northern Kentucky water districts have elected to close water intakes until the chemical passes, just in case. But Louisville still plans to keep its intakes open. Spokeswoman Kelley Dearing-Smith said the water company believes the chemical will be so diluted by the time it gets here, it will be treated by the company’s riverbank filtration system and won’t pose any threat to human health. That will probably be the case. But all of these water districts—in West Virginia, in Cincinnati, in Louisville—are basing their decisions on science which very may well be flawed: information from the Centers for Disease Control and Prevention.